Ladies, you will be able to drag knees in confidence while wearing this suit. The Dainese Assen Perforated Women's Race Suit offers a high level of protection, comfort, and quality. With its 1.2mm Tutu cowhide leather, CE Level 1 certified knee armor, aluminum insert on the shoulders, and flexible CE Level 1 hip armor, the Assen Perforated Women’s Race Suit is not cutting any corners when it comes to protection. The level of comfort this suit has matches its high protection level. With a generous amount of perforation throughout the race suit, accordion elastic panels, and S1 bi-elastic fabric inserts, you will be able to focus on the important things, like getting faster lap times, instead of wishing you would have purchased a more comfortable suit. 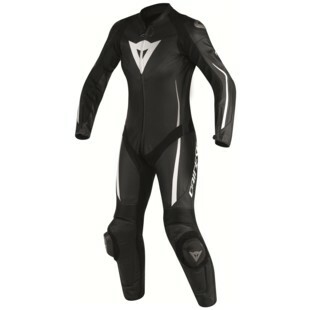 Overall, this Dainese Assen Perforated Women's Race Suit is designed for the girls that are putting time in on the track and need a race suit that works with them in terms of fit and also protects them when needed.